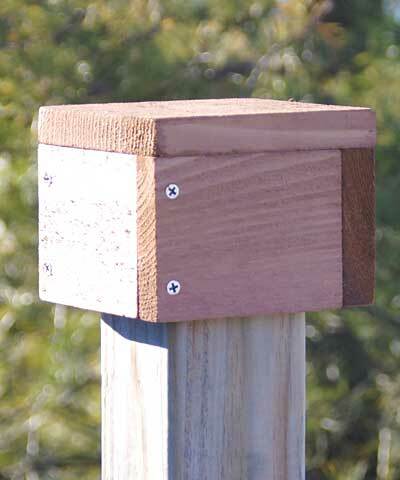 Creatively attach your favorite bird house or feeder to a 4 x 4 post using the Looker Products Post Cap. This square unit connects to your existing outdoor item in moments, using the four predrilled holes on its base and included screws. The holes are each spaced 2" apart, accommodating an item with a 3" square or larger base. To cover the full adapter, ensure the base of your feeder is at least 6" square. The 3.5" tall sleeve installs over the top of a 4 x 4 wooden post, creating a secure mount. Made from western red cedar, this adapter will certainly withstand use for many seasons, and will age beautifully over time. Easily mount a bird feeder or bird house to your existing 4 x 4 post with this Post Cap. Made in the USA.